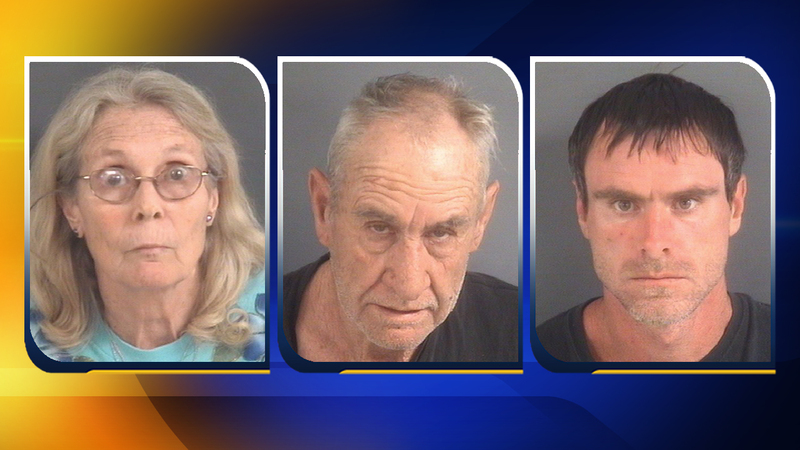 CUMBERLAND COUNTY, NC (WTVD) -- The Cumberland County Sheriff's Office took three people into custody after raiding a home that allegedly was being used as a meth lab. The Cumberland County Sheriff's Narcotics Unit along with the SBI executed a search warrant April 5 on Blue Bird Lane after investigating complaints from neighbors in the area. Timothy Wayne Huff, 64, was charged with manufacture methamphetamine, possess precursor chemical: pseudoephedrine, sulfuric acid, possess precursor chemical: ammonium nitrate, petroleum based solvents, lithium metal, possess precursor chemical: ethyl ether, sodium hydroxide, conspiracy to manufacture methamphetamine, maintaining a dwelling controlled substance & possession of drug paraphernalia. Curtis Wayne Huff, 34, was charged with manufacture methamphetamine, possess precursor chemical pseudoephedrine, sulfuric acid, possess precursor chemical ammonium nitrate, petroleum based organic solvent, lithium metal & possess precursor chemical ethyl ether, sodium hydroxide, and conspiracy to manufacture methamphetamine. All three are being held under a $100,000 secure bond at the Cumberland County Detention Center.